Yes, this review is several months late. Yes, I've now read this book twice. Yes, it was worth it. Very, very worth it. The first time around, I started reading it the Friday after it was released (around 4 pm) and finished it 1 AM Sunday morning (so, really it was still Saturday). This time, I was in the middle of binging Chuck on DVD, so it took a little longer (I started it Friday night and finished it this afternoon). I did, however, read the majority of it yesterday and today (I finished season 2 of Chuck and decided to put off season 3 until I read a couple of books). Moonflower is the last of the Pink Carnation novels (I think it is number 12 or 13, but I've lost count at this point), so of course it is Jane's book. If you haven't read the other books in the series, now would be a good point to start on that. I'll wait. In all seriousness, if you haven't read this series yet and don't want to be spoiled on key details STOP READING. FOR THE LOVE OF ALL THAT IS HOLY, STOP READING!!! Where was I? Oh, right. 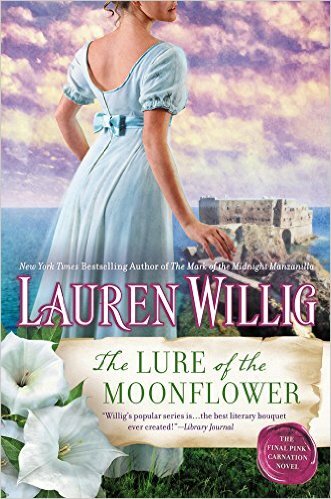 The Lure of the Moonflower is Jane's story. She is our main heroine throughout all of the books. Each book had its own couple, starting with Amy and Richard, but Jane was in the background of all of them (except for the second to last book, which I did not like and do not ever plan on re-reading because really it is absolute, total filler). No, I have not gotten over my disappointment in that book. Yes, I am aware it has been well over a year since it came out, but come on! It had no spies and relied on the overused vampire trope, even though he wasn't a vampire. Ugh. I HATE that book. I think everyone who read Plumeria, which should have been the 2nd to last book, dammit, at least suspected that Moonflower, aka Jack Reid, was going to be Jane's hero. Who else? It sure as hell wasn't going to be The Gardener. The action in this book takes place two years after that of Plumeria and about a year after that book, so it is now 1807 and Jane is in Portugal, trying to restore Queen Maria to the throne, despite whatever psychological illness Queen Maria suffered from thanks to the seriously inbred royal family. (I'm fairly certain that they were brought up in this podcast--if you are not listening to Nerds on History or Nerds on Film, you need to because these people are awesome!) Unfortunately, Jane does not speak Portuguese and she does not know her way around Portugal. That's where Jack comes into play. Now, that he's switched sides (he was originally working for the French/The Gardener, but because of something the Gardener ordered him to do, he started working for the English and William Wickham) he's been assigned to keep an eye on things in Portugal since Napoleon really wanted his empire to stretch across all of Europe and they believed that he was after Queen Maria. Neither Jack nor Jane were happy to be working together, although Jane had some understandable reasons for not wanting to work with him. If you're familiar with the series, you're aware that other than Jane, there was one other character that was in the background of every single Carnation book--Eloise Kelly, the American historian searching for the identity of that flowery spy, while falling in love with the descendant of another flowery spy (the Purple Gentian--aka Lord Richard Selwick, hero of book 1, The Secret History of the Pink Carnation). In this book, Eloise and Colin are embarking on their life together with the wedding to end all weddings, held at Selwick Hall. Of course, they also have to deal with the kidnapping of Colin's aunt, Mrs. Selwick-Alderly. Put the two parts together and you get one weirdly endearing, updated version of Romancing the Stone, which I picked up on fairly quickly despite only seeing bits and pieces of the movie. Hell, Jack was even the first name of the hero from the movie! Willig has even mentioned in interviews that she pictured Jane sitting around a campfire with a guy in a hat. I wonder if subconsciously this image was her inspiration for that scene (which wasn't in the book, btw). What I liked about Moonflower is the same thing I like about all the other Carnation books (barring that book). It is smart and funny. She doesn't talk down to her readers; she assumes that they're all smart enough to understand what she's writing. Willig's prose has a fluidity not seen in many other books and it was one of the first thinks I noticed about her books when I started reading them in 2011 (six years after the first book was released). I love that she puts all these little pop culture references in them--in one book, she alluded to Culture Club's Karma Chameleon. I also like the fact that we get an update on some of the other characters in the series, namely Richard and Amy (although Amy was not present in the book), Miles and Henrietta, Miss Gwen and Colonel Reid, and Lizzy Reid. You have no idea how happy I was to see Miles and Henrietta--The Masque of the Black Tulip has been one of my favorite books since the first time I read it. I love Miles. He and Henrietta were perfect for each other.